We offer fly casting and fly fishing classes for fishermen of all skill levels. Beginners classes are geared toward casting and understanding the basics. If you have been out before and are struggling or have never picked up a rod, this is a great way to eliminate years of frustration. Learn the basics of equipment, casting, entomology and knots that will keep you in business on the water. We will also teach you the basics of fly selection and how to read water. With these basic skills you will be able to get out on your own and experiment with the sport. Intermediate fly fishermen will benefit from years of casting instruction and thousands of hours of on stream experience. Learn how to correct those bad habits in your casting or how to catch more fish by understanding the dynamics of the stream. These classes are tailored to the fisherman and his/her ability. There are many schools out there to teach you how to cast. We can teach you how to cast and be a better fisherman. For the accomplished angler, there is always room for improvement. We should always be learning, but when you stop it is time to quit. Advanced classes are about getting to the next level. We are always ready to learn something new and the best way to learn is to ask the hard questions and figure out the answers. It may be problems with specific casting situations or how to catch extremely educated fish. The goal for the advanced angler is to come away with new techniques for old problems. Our favorite way to teach is with individuals or in small groups of friends and family, but we are also able to accommodate large groups. If you have a large group, we have a small staff of casting instructors who are available to assist. For groups, we can also create a classroom setting with slides and a casting pond with advanced notice. 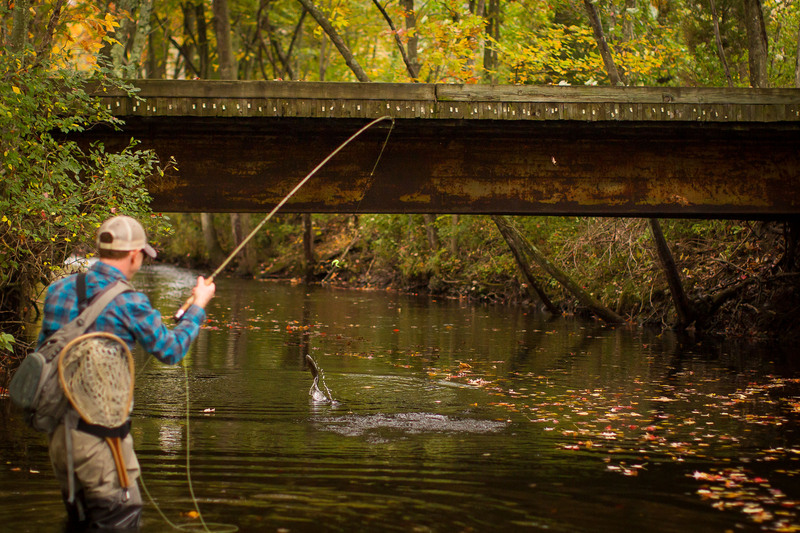 We teach casting on a private pond or lawn near a local stream. Lessons on fishing skills are done on stream of choice or at the anglers request.